I had never attempted origami before, but the instructions for an origami heart intrigued me, so I gave it a whirl. This was so easy, my very first one looked good, and the second one was almost perfect. Carla's Bloomize blog has instructions for some that are a little more complicated, but much prettier. I'm going to try them any minute now. 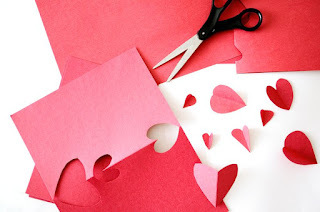 Making origami hearts is especially great as a project for kids. These are handy for Mother's Day, Father's Day, birthdays, anniversaries, thank-you notes to Grandma, etc., etc., etc. When I first saw pictures of deep red Valentine's Day fortune cookies, they looked so good I thought they were edible. Made from felt, they are reusable, and not much harder to make than the folded paper hearts. Unlike the origami items, they require scissors and glue, so there is a lot more risk involved. However, the cuteness factor is so great that it might be worth spending the afternoon feeling all sticky. 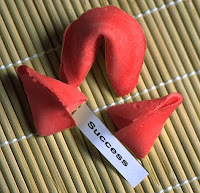 With a little red food coloring, it would be easy enough to make real fortune cookies with a holiday theme. Either way, you get to include your own, very personal fortunes (and add "in bed" whenever you like). An even easier way to do this is to buy a bag of fortune cookies at the grocery store, and use tweezers to remove the fortunes and replace them with yours. If just thinking about all this hasn't completely exhausted you, there are several more Valentine craft ideas to inspire you on the Martha Stewart website. Brilliant research Rosemary! I love the fortune cookies especially. I'm going to give them a try. I also have a little surprise in stall for my hubby which is arts and craftsy but which I had better not reveal yet. I've bought all the bits for it... just now have to work out how to make it without making a mess! Oh boy, Rosemary. I envy you and Grace. My arts and crafts skills are limited to what I did in my first grade classroom. They all thought I was brilliant, but I knew better. I suppose CJ will have to settle for a post-it note or something.